At the time, French was not the highly organized and officially maintained language it is today (Viz, l'École Francaise). The dialect of middle French that became the language of the elite was Norman French, which was spoken in northern France. This dialect had many idiosyncrasies, including the colloquial habit of only using the plural or respective pronoun "vous" and neglecting the informal, singular pronoun "tu." Over time this habit was adopted by the native English speakers, especially as marriage between native English speakers and French immigrants became more common. That is the primary reason the "thou" form of English has died out over time. There are other factors, but by the 20th century the form died out almost completely in common use. I want to say "You" when I pray. I speak four languages fluently, an additional three to four conversationally, and I get by in others. I am familiar with a lot more. In all the languages that I am familiar with, except Afrikaans (fill me in if anyone knows of an exception here), people pray using the singular, informal pronoun. I like using the "you" pronoun when I pray. I often pray in other languages because I want to use what I feel is a more intimate pronoun and I want follow the teachings of the prophets and apostles who have explicitly taught that we should use "Thee," "Thou," "Thy," etc. I have often wondered, don't the apostles know that "thee" is not a formal pronoun? Why would they instruct English speakers to use "Thee" and call it the "respectful" way to pray? "You" is both natural to English speakers and is actually the formal, respectful way to address someone. Perhaps they know that it is actually the more intimate pronoun and it is appropriate to address God our Father in the intimate pronoun of our native language. But, "thee" is also the pronoun used for individuals of lower and inferior rank. It just hasn't made sense to me. So, why do we pray using "Thou," "Thee," "Thy," "Thine"? I was bothered for a long time and felt flustered when I simply obliged and prayed in the manner that was instructed. Why use "Thee" other than some spiritual and religious leader that I follow said I should? Well, there is at least one other reason. When William Tyndale, and subsequent translators, translated the Bible into English from Hebrew and Greek, he chose to keep the distinction between "Thee" and "You" to reflect the singular and plural pronouns from the source languages. Indeed, the Bible uses the pronoun "Thee" for Jesus and God for the sake of indicating that they are single individuals. This creates a unique doctrinal congruency that I previously did not understand or appreciate. God is our father. Jesus is the son of God and is our savior and advocate. The Holy Ghost is a spirit that communes with us as a spiritual mediator. I appreciate the perspective that when I pray to God using the "Thee" form, I inherently confirm that He is my God and true Father. Because I do not believe in the concept of the trinity, the distinction between "Thee" and "You" has become special to me. I pray often and most of my prayers are informal and are often more of a form of meditation and spiritual reflection than a shared or public dialogue with deity. 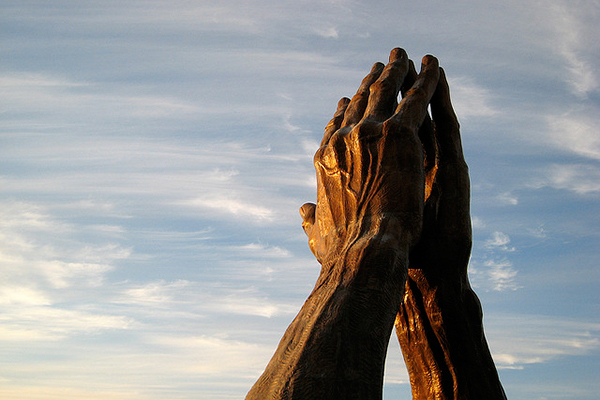 The language of prayer has simply been a bit of a stumbling block for me. It is not an essential aspect of the gospel, but it has been one of my "objects of consideration" for a while. Prayer is an essential aspect of the gospel, and this has helped me reason the clear teachings of church leaders, my personal feelings, and understanding. Here are great wikipedia entries on the some of the topics discussed in this article. Tanner was born and raised in Georgia, with a few years in Alabama. He has a delightful wife, Sarah, two spirited sons, and a newborn daughter. He currently works in research and development creating phonetic software and programs. He served a mission in the Czech Republic and Slovakia. Tanner played football and rugby through high school and college and was a male cheerleader his last year at BYU. His time is mostly split between family, studying, and work. You can read Tanner's other posts here. Image credit: Jill (used with permission).